There was a great opportunity for health professionals and patients to learn more about the latest developments in treating Tinnitus in a seminar at Royal Surrey to mark National Tinnitus Week. 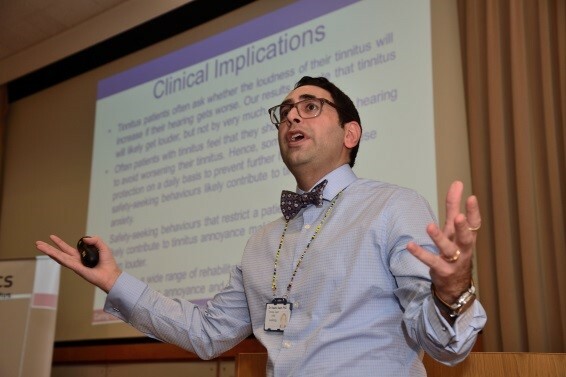 Over 180 people attended the ‘Tinnitus and Hearing Impairment Seminar’ which showcased new research from Royal Surrey specialists who treat the painful and distressing hearing condition. Up to 15% of the UK population is believed to suffer from persistent tinnitus which is commonly described as a persistent ‘ringing’ in the ears. In the second part of the seminar, Consultant Audiovestibular Physician, Dr R Srinivasa Raghavan looked at medical evaluation and treatments for tinnitus combined with hearing loss. A question and answer session which addressed patient experience was led by Jemma Hatton, a specialist in Tinnitus and Hyperacusis Rehabilitation. “Tinnitus currently affects about 10-15% of the UK population and up to 30% of the population may experience it at some time in their lives,” said Hashir. “It can be an extremely debilitating condition but there is not enough public understanding of its causes or the treatments that are available. If you want to know more about Tinnitus listen to Hashir’s informative description of the condition here. View a short film of the seminar and an interview with Hashir here. The Royal Surrey County Hospital is a leading general hospital and specialist centre for cancer services and treatment, based in Guildford. It serves a population of 330,000 people for emergency and general hospital services across south west Surrey. St Luke’s Cancer Centre serves 1.2 million people, offering state of the art diagnostic and treatment services. In 2018 the Trust started providing adult community healthcare for people in Guildford and Waverley with Procare Health (the federation for GP practices).This is the first time an acute Trust has joined forces with a GP federation to provide adult community health service in this way.